Rarely do I find myself driving out west to Sherway Gardens when I am tucked in the heart of downtown Toronto in my daily habit of transit commute. In fact, it's rarity that I drive on my own unscathed (Mom, Dad, I hope I made you proud). However, this occasion was different and a very special one. 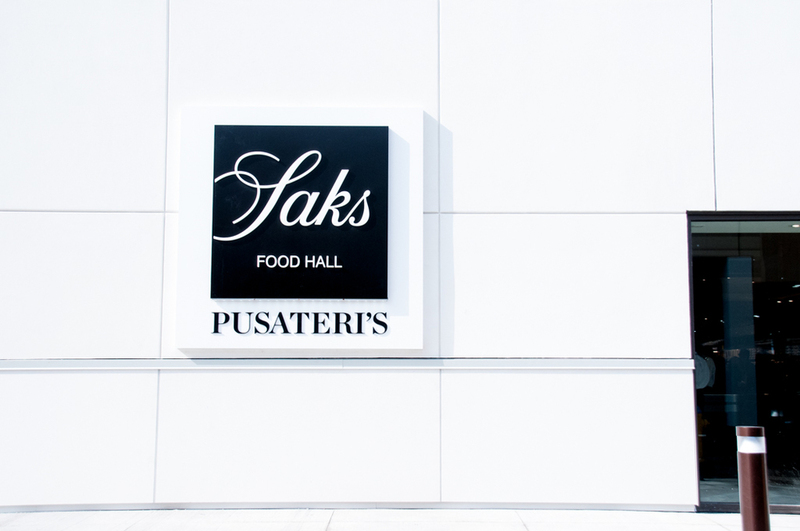 When I received a message about a photography opportunity for Pusateri's grand opening of the world's first Saks Food Hall, my reaction was about the equivalent of a 5-year-old doing splits on a trampoline. I became grateful for the many times my sister made those Pusateri's grocery runs during her visit from London, UK. Her taste in artisanal cheese and crackers really grew on me. My love for food transcends almost everything else in life (which, to my boyfriend's dismay, means that I usually don't have leftovers on my plate for him to finish). Food and photography? That makes my heart sing to the angels in heaven. According to Frank Luchetta, President and CEO, plans to open a food hall with Saks Fifth Avenue has been 3 years in the making and it's rewarding to see it come to fruition years later in a 18,500 sq-ft space. I admire the staff and the team for working tirelessly around the clock to open up a store like this. Long nights and early mornings are what would define the course of the grand opening week, but the learning experience makes it worthwhile. So a collaboration like this with Saks makes complete sense for the Pusateri's brand, which has a reputation for excellence and a passion for fine foods. This is a great example of when visions and missions align together to create a beautiful partnership. At first glance, I was amazed at how bright and grand the space is. The installations are stunning in earthy tones, surrounded with high ceilings, brightly lit aisles, and interesting herringbone floor patterns. The setup is inspired by the famous Harrod's Food Hall in London England, which undoubtedly gave a European feel. Needless to say, I felt quite nostalgic about Europe. The grand opening kicked off with a panini cutting ceremony of a 10-foot-long panini that would have taken the place of a traditional ribbon. Several Luchetta and Pusateri family members were on hand including Frank's mother Dina Luchetta, who I had the pleasure of meeting, and several of whose recipes are featured as prepared meals available in-store. The media tour commenced at 10am where the press was led through the store by Pusateri's General Manager John Mastroianni and President Frank Luchetta along with Corporate Chef Tony Cammalleri, who explained that the food at Pusateri's is always best in-class. Supporting local is key to sustain a vibrant city. 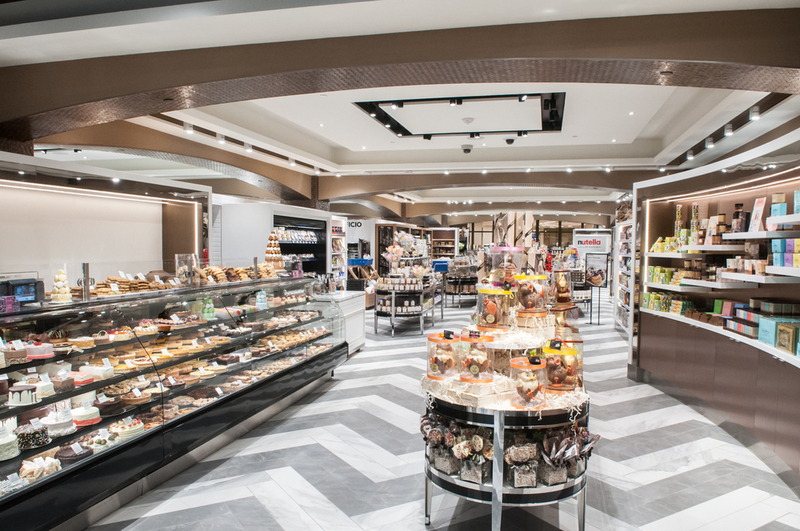 The Saks Food Hall by Pusateri's has done a wonderful job of bringing together a number of smaller independent family-owned companies that are hands-on organic and natural-method producers. A defining feat in my opinion, as they're a necessary part of the future of the food industry. 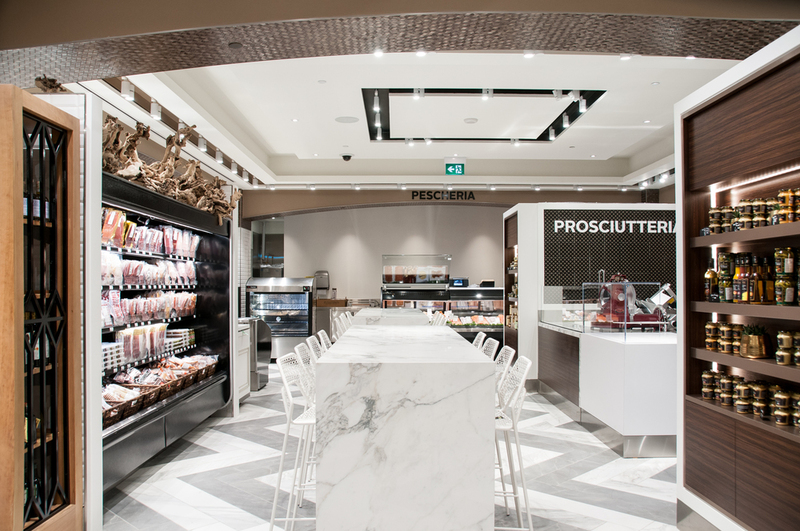 Out of all the culinary stations, the proscuitto bar reigns as my overall favourite. 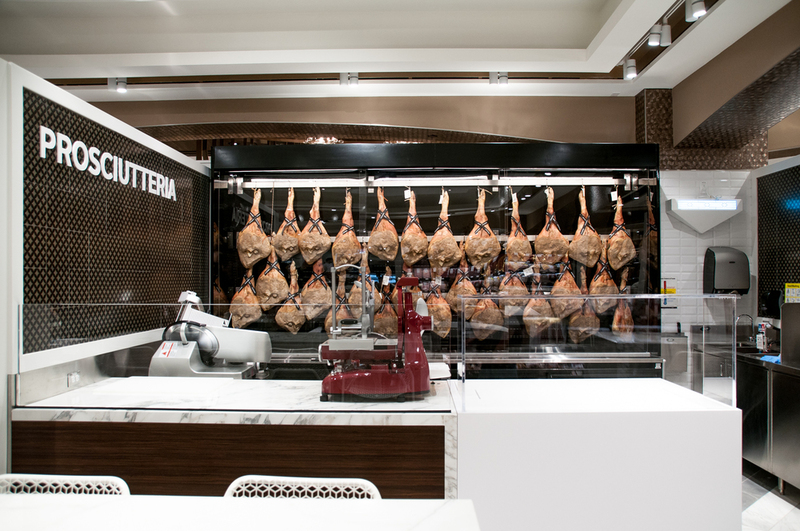 It features port cured pork products supplied by Niagara Falls-based Pingue Prosciutto. Mario Pingue was on hand to debut the store and explain his family's dedication to crafting products in the Italian tradition, creating better-tasting salumi from humanely treated and naturally-raised animals. On opening day, shoppers were offered a wide range of sample products to taste, including at the cheese counter, where Dutch Beemster cheese was being featured. As the first Ontario grocery store with a liquor licence covering the whole floor space, that's a hurrah for shoppers who can now drink while they browse the shelves of single-estate olive oil and hand-raked sea salt. You can also get a tumbler of sake from the sushi station along with your poke bowl, or a classy drink of choice from the champagne bar. I had the chance to try the mouthwatering Inari Dragon Roll, which screams for a second bite. It has cooked baby shrimp salad, mango roll, inari tofu, teriyaki sauce, fresh micro greens, fried onion, and yes, Sriracha sauce. As if the sushi bar wasn't enough, Toronto's second Nutella cafe made a splashing debut at the store, catering to everyone's secret guilty pleasure. Even after I've attempted to cut down on processed sugars in my diet, I still can't resist a bite out of the hot and fresh Nutella crepes. 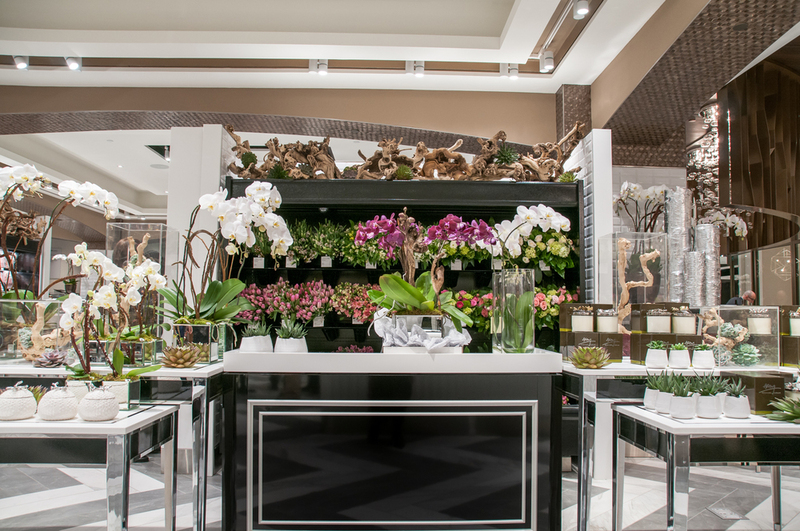 To provide a holistic experience combined with shopping, Pusateri's offers catering, floral and giftware services available too. This is the icing on the cake, making the store a top destination for entertaining guests, treating yourself, or just generally living the high life. 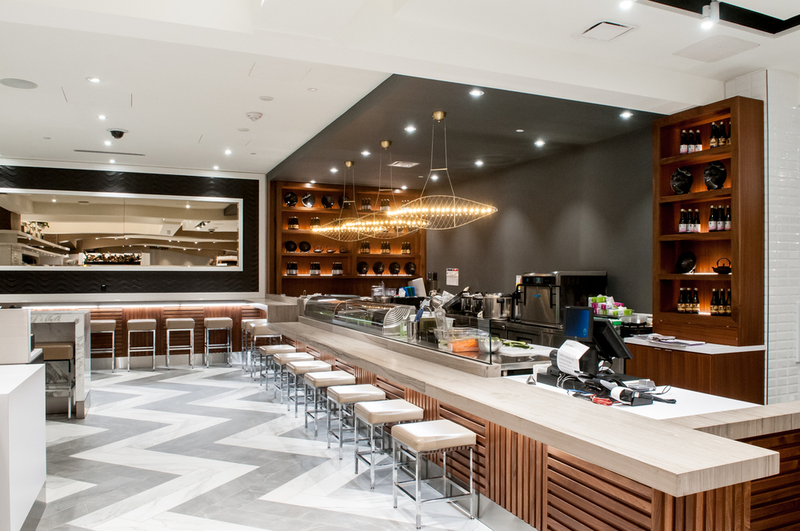 On weekends, you can enjoy brunch served at the champagne bar and offered to-go at the prepared foods counter. 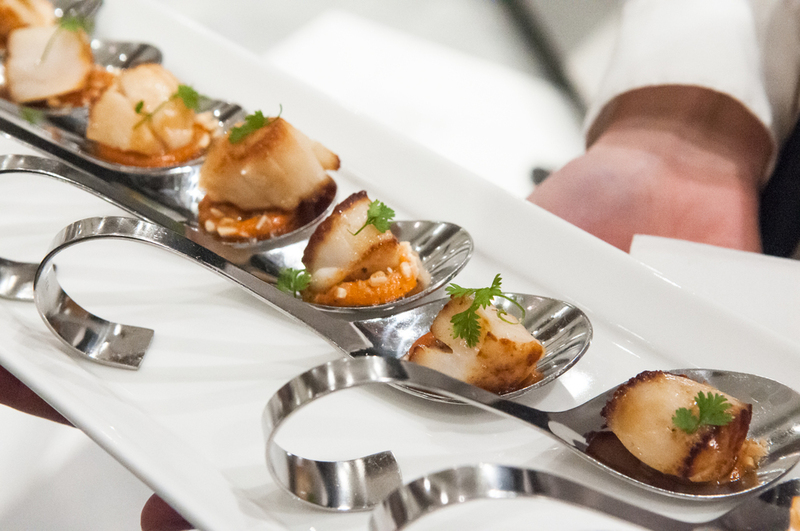 Hats off to Chef Tony Cammalleri, who's the mastermind behind it all. it's one of the best brunches I've had in a while. Stay tuned for a separate post! The Queen Street location opening late Spring at Saks Fifth Avenue Eaton Centre is estimated to be about 50% bigger than its Sherway predecessor. Bigger and better, perhaps? Visitors will be in for a surprise in the next coming weeks. Maha's is one of the most talked about brunch spots to date. Even amongst the tidal wave of Middle Eastern and Mediterranean restaurants, they still manage to rise to the top and make the list. "Best Shakshuka in Toronto" and "Top 25 Soups in Toronto" by BlogTO, to name a few. Yet the restaurant is just over one year old. 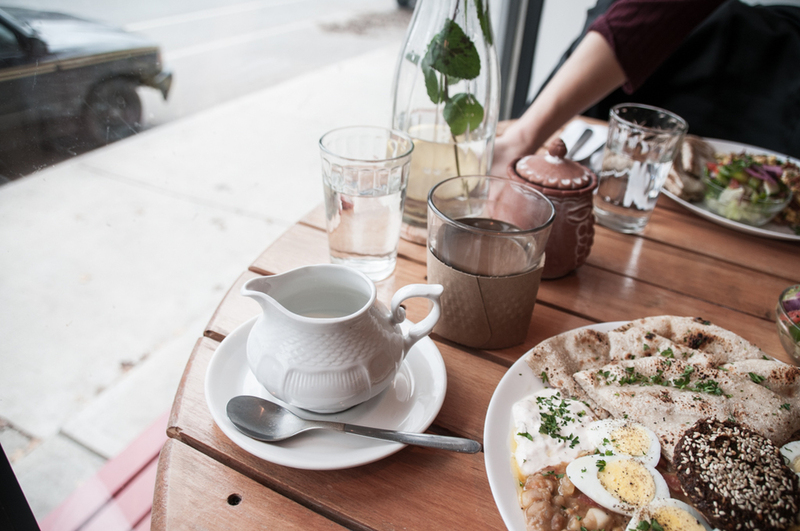 No longer is Egyptian cuisine a foreign concept to Torontonians, as head chef Maha Barsoom and her family are trying to change that. How? By cooking the way she cooks at home. Home is a feeling rather than a single place, and what makes my heart melt every time is the cozy, warm feeling of eating home-made food. And what's more, Barsoom is able to show just how different and flavourful Egyptian is. Maha's cooking is influenced by Greek, Turkish and French, as they all occupied her home country Egypt at one point. What's most striking is that Barsoom makes her own Egyptian version of feta. If only I could take some home and sprinkle it like confetti on every dish possible to my stomach's content. Recommended for first timers is the Cairo Classic platter ($12). If you haven't seen this on social media, you've probably been living inside an oyster shell. It's a medley of tomatoes, onions and perfectly seasoned fava beans swimming under a delicate layer of sliced boiled egg cradled around a falafel in the centre. On the other half of the plate is a dollop of their creamy home-made tomato feta and pieces of charred balady bread, an Eyptian pita-like flatbread. It comes with a small side dish of refreshing house greens. The Basturma Scramble ($11) is also a delicious bet, if you're wondering about playing the dice correctly. This is far from your average scrambled eggs. It has thinly sliced cured beef mixed with fenugreek, garlic and Egyptian spices, sauteed in butter. And wow, it's incredibly savoury down to every last bite. It's also served with house greens and freshly charred balady bread, which serve as utensils to scoop up flavourful bites of the leftover sauce and scramble. Other notable counterparts on the menu is Maha's award-winning vegan Lentil Soup ($9) that won Barsoom her first prize in a cooking contest when she first moved to Canada. And a Date Grilled Cheese ($12) featuring a unique blend of gouda, havarti, and swiss cheese for some much needed comfort food. For the java lovers, there's Honey and Cardamom latte and incredibly bold & dark Turkish coffee to satisfy your caffeine cravings. I rarely ever frequented Leslieville (or anywhere past Riverdale), but Maha's gives a good reason why the east end of Toronto has the best kept secrets. It's such a delightful gem to the neighbourhood. The staff are fantastic and the food is simply outstanding. I felt like I left home only to be welcomed at another home. Sign up to receive the latest and greatest updates! “Hate cannot drive out hate; only Love can do that.” Dr. Martin Luther King, Jr.